Accepted Scientific Name: Haworthia viscosa (L.) Haw. Haworthia asperiuscula var. patagiata G.G.Sm. Haworthia asperiuscula var. subintegra G.G.Sm. Haworthia beanii var. minor G.G.Sm. Aloe cordifolia (Haw.) Schult. & Schult.f. Aloe subrigida Schult. & Schult.f. Aloe subtortuosa Schult. & Schult.f. Haworthia tortuosa f. variegata hort. Aloe asperiuscula (Haw.) Schult. & Schult.f. 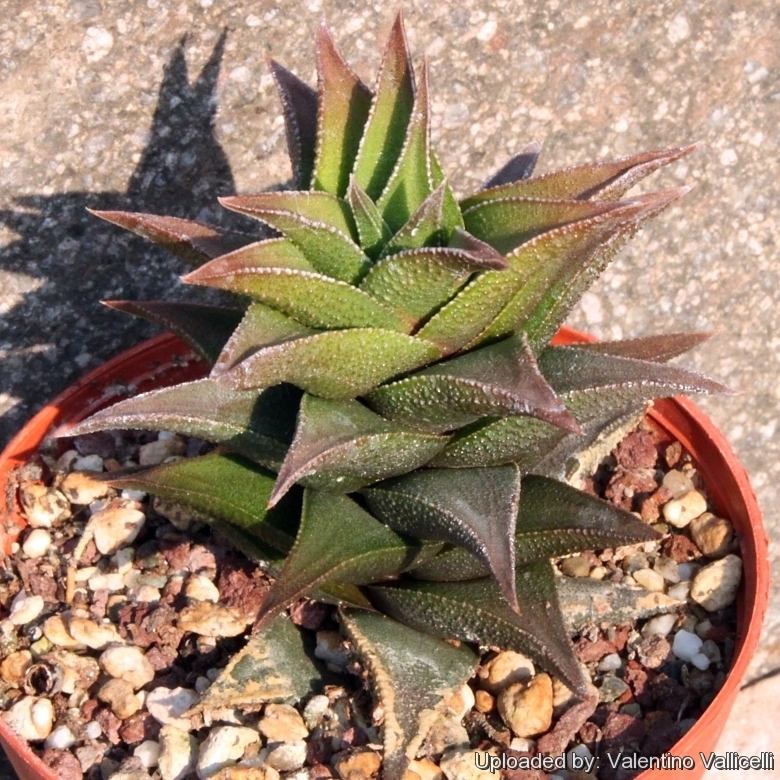 Haworthia viscosa var. caespitosa Poelln. Aloe concinna (Haw.) Schult. & Schult.f. Haworthia viscosa var. cougaensis G.G.Sm. Aloe indurata (Haw.) Schult. & Schult.f. Haworthia viscosa var. major Haw. 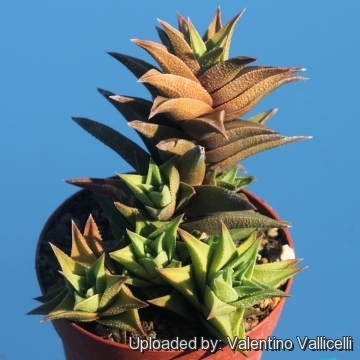 Haworthia viscosa var. minor Haw. Haworthia viscosa var. parvifolia Haw. Haworthia viscosa var. quaggaensis G.G.Sm. Haworthia viscosa var. subobtusa Poelln. 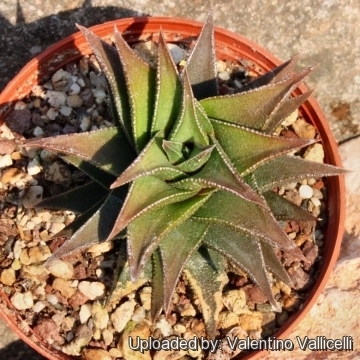 Aloe torquata (Haw.) Schult. & Schult.f. Haworthia viscosa var. viridissima G.G.Sm. Description: H. tortuosa var. 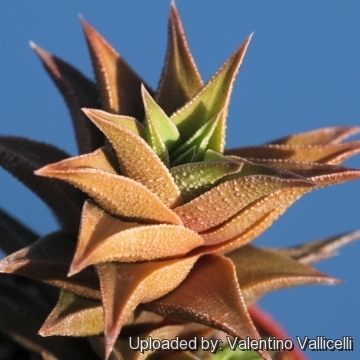 pseudorigida is a small leaf succulent, which forms characteristic series of leaves arranged in spiral along the stem. The name pseudorigida (from Greek “pseudo” false and “rigidus”“ almost-solid) refers to the consistency of the leaves, tha are very hard and firm. 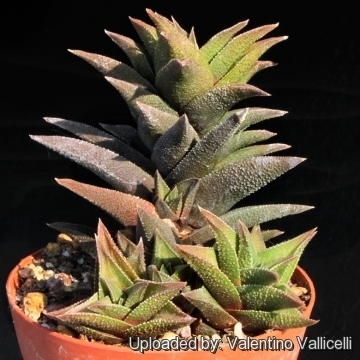 It is a larger growing form but hardly distinguishable from other Haworthia tortuosa varieties. Daughterly rosettes are abundantly formed at the base of the older plants. Stem: Up to 20 cm tall. Cultivation and Propagation: This is one of the choicest haworthias. It needs regular water, but do not water again until dry. Also, it is a species that is dormant in the winter and requires very little water (maybe even none) during the cold months. Prefers a draining acidic soil without limestone. Frost Tolerance: Light frost protection required. Minimum of 5º C for safe growing (but hardy up to -5°C or less.). Sun Exposure: Some shade is also in order; it can be sunburned if moved from shade/greenhouse into full sun too quickly. The amount of sunlight it can withstand without scorching depends upon how hot it becomes in the summer in the location in which it is planted. It will have more colour if it receives more light. During the spring it may be able to take some sun until the heat arrives at the end of spring. In an area that has hot afternoon sun, it may be able to take full morning sun, but requires afternoon shade or afternoon light shade. Propagation: Usually by seeds or offsets that appear at the base between the leaves; leave them attached until they are 1/3 the size of the parent and then detach and plant.